I think it’s important that we all remain permanently skeptical of the government any time the government offers to help. I feel the same way about this as many of you do. It’s undeniably true that our current government is wasteful at just about every level, from the feds all the way down to City Hall. But we simply can’t afford to continue dealing with the ever-increasing premiums and lesser choices that we’re getting with our profit-driven healthcare industry. The 6% of GDP that represents the difference between what we spend on healthcare, and what the Netherlands spends (for much better care) comes to about $1.2 trillion per year, or $100 billion every month. The market for televisions is a free market, for example. We don’t have to buy a TV, and that means TV manufacturers and retailers are both competing not only against each other, but against whether or not we buy a television at all. And this competition drives prices down and quality up as manufacturers and retailers attempt to earn our money for their products. Healthcare, on the other hand, is not and cannot be a “free market.” We don’t get to choose anything about it. We don’t get to choose when we get sick or have an accident; we don’t get to choose the price of the procedures that will be needed to heal us; and we don’t get to choose which hospital we go to when we are picked up in an ambulance, either! For that matter, we don’t even get to pick the ambulance company or anything related to our ride to the hospital! This is not because our healthcare is better. It isn't. We rank 37th in the world, behind all of the countries in this chart. This is the definition of a captive market, and captive markets drive prices up and quality down; the opposite of free markets. Actually, it’s worse than a captive market, because in a captive market, you can still say no. You can’t really say no when you have a broken leg, or cancer. For an example of a captive market in action, have you ever gone to a professional sporting event? At a Major League Baseball game, for example, a beer and a hot dog can set you back more than $10! The exact same products at a convenience store would cost as little as $2.50. But if you’re at a baseball game, it’s not like you can leave and go to 7-Eleven for your refreshments, right? That makes you a captive market. That’s why they can quadruple the price on you. You have no other options. Now, to further this analogy, imagine how much they could charge for a beer and a hot dog if you might die without them! That is why we spend, by far, the most on healthcare of any country on the planet (over 18% of our country’s GDP every year and rising), and are still ranked behind 36 other nations in terms of quality of care. (It should be noted that all 36 of those nations ahead of ours have some form of universal healthcare.) None of those countries have to worry about "pre-existing conditions" either. Do you know what they call a "pre-existing condition" everywhere else in the world? Your medical history! "Pre-existing condition" is a legal term made up by insurance companies in order to justify not paying for your medical care. It's not a real thing anywhere in the world but here. Where's all that money going? Here. And to shareholders, other executives and administrators, etc. It's definitely not being spent on patients. 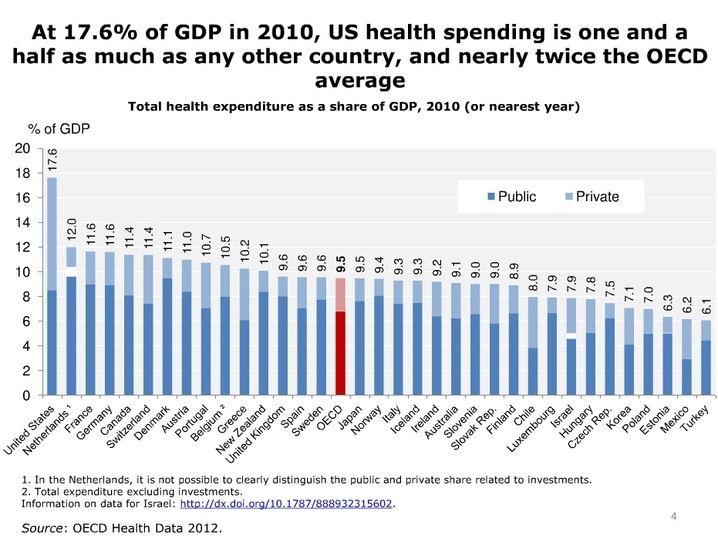 Every country ranked higher than ours in terms of quality of care spends under 12% of its GDP on universal healthcare, and everybody is covered. And again, they rank higher than we do in quality of care. Bloomberg even does a study every year where they create an index that combines quality of care and spending, and among the 55 nations included in the rankings, our country ranked 50th! I believe we need to move our country away from profit-driven, captive-market healthcare and institute a universal healthcare system that will bring our costs down to the ballpark (so to speak) of 12% of our GDP. That would save our entire economy over $1 trillion per year. If you divide that into the number of Americans with jobs, that $1 trillion per year comes to over $900 per working American, every month. To achieve this, I don’t believe we need to reinvent the wheel. All we need to do is look at the countries who are doing it right and adapt their programs to the USA. Oh, and don't forget these people. Big Pharma has managed not only to secure themselves massive profits, but they even get taxpayers to cover their R&D much of the time. This isn't business. This is theft. That’s not going to happen. The highest-paid doctors in the world are actually in the Netherlands. They have universal healthcare that costs them only 10.9% of GDP as of 2014, and their nation’s healthcare is ranked fifth in the world. Again, we’re 37th and spend over 18%. Another common objection to universal healthcare, or a ploy to lower costs for our current system, revolves around the issue of medical malpractice in our country. People will often say that a big part of the reason medical costs are so high is because of malpractice. It’s not true. It accounts for only 2.4% of our total healthcare expenditures ($55.6 billion as of 2010), according to a Harvard study published in Health Affairs. If that number of 2.4% surprises you, this next number is going to floor you: Of the $55.6 billion that is spent on malpractice, $45.6 billion of it is actually spent on “defensive medicine” practiced by physicians to stay clear of lawsuits. That means the actual number malpractice suits cost our system is less than 0.5 percent of our current healthcare costs. In my opinion, adopting a system like they use in the Netherlands, for example, wouldn’t just end our healthcare crisis for good, but it could actually be a key to really boosting our economy as a whole. Freeing up over $1 trillion to spend in our country’s true free markets would be a boon to industry and potentially lead to the creation of millions of jobs. And obviously it would also ensure that people who get sick will be given the care they need, decided by doctors rather than insurance companies, without risking losing everything they've worked for their entire lives.